In this day and age, women are constantly bombarded with the world’s opinions on how they should look, how they should act, and what should be important to them. 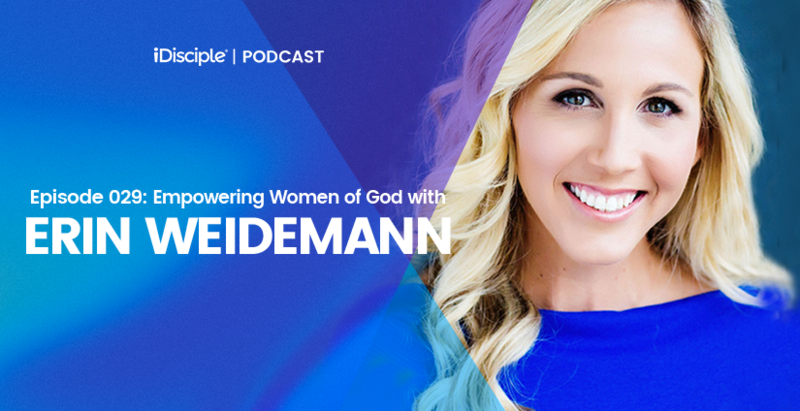 Today’s guest on the iDisciple Podcast, author and speaker Erin Weidemann, is setting out to teach women of all ages to turn their backs on the world and pursue the life God has for them. As founder and CEO of Bible Belles and an award-winning author of The Adventures of Rooney Cruz series, Erin Weidemann is committed to changing the world’s current definition of beauty. As a certified teacher, coach, and nationally recognized speaker, she offers speaking, workshops, and seminars to equip women of all ages to let go of fear and step into the unique leadership roles for which they were designed. A five-time cancer survivor, Erin lives in San Diego, CA and speaks at events, conferences, fundraisers, churches, and schools. Erin is also the host of the Heroes For Her podcast, interviewing celebrities, actors, musicians, and other women who are living out their passions in line with their personal values. Today, Erin is joining us to talk about how her life-changing cancer diagnosis changed the trajectory of her life, the inspiration behind her faith-based children’s books for little girls, and her advice for women who are struggling with their purpose and self-image. We hope and pray that this conversation encourages and emboldens our female listeners and helps all of us raise up young women after God’s heart! Erin shares how she found herself on her knees praying to God after her cancer diagnosis even though she didn’t have a relationship with Him. Why she believes our purpose is already laid out, and how searching for God to reveal more of Himself will reveal that purpose to us. How shocked she was that her niece knew every Disney princess, but didn’t know any women in the bible, why that lead her to creating Bible Belles. The reason why Erin is so adamant about young women having positive role models with a different outlook on beauty and identity. Erin walks us through the women she has written about so far, and each of the important themes they are centered around. Why Erin has started speaking for women of all ages around the topic of self-love, and the struggles she had as a young girl with her body image. If you would like even more life-changing content about finding biblical truth, download the iDisciple app for your preferred mobile device today! Since 2013, iDisciple has been leading people into a closer relationship with God through music, sermons, and devotionals, all in the palm of your hand! Check out www.idisciple.org to learn more, and sign-up for iDisciple today.